Apple cider marinade—so effortless, you'll never want to go back to traditional pork chops and apples again. Combine apple cider, mustard, celery seed, salt, and pepper in a shallow baking dish or gallon size bag. 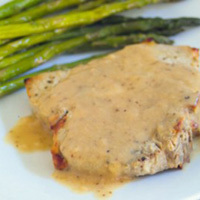 Add pork chops and marinate in the refrigerator for 4 hours or overnight. Reserve marinade after marinating. Preheat broiler, grill, or grill pan. Broil or grill chops until browned. Preheat small skillet or sauce pan. Add olive oil. Whisk in flour. Cook flour until fragrant. Whisk in reserved marinade. Bring to a boil and simmer until chops are done. Serve with simple roasted vegetables.